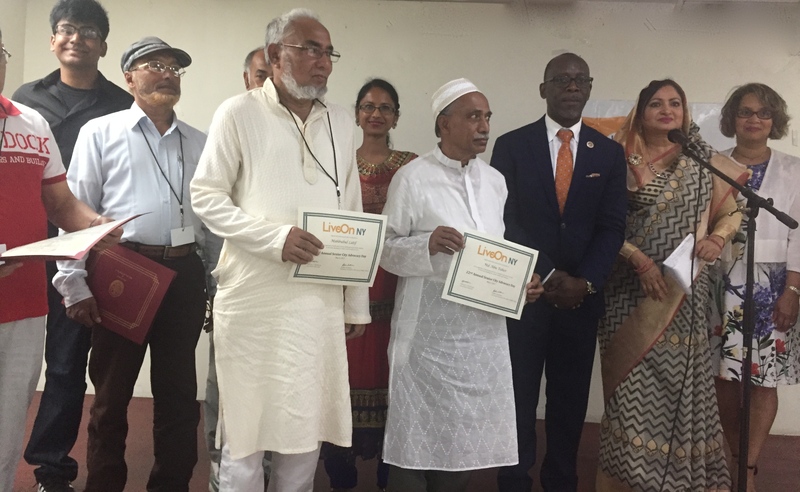 India Home’s Desi Senior Center held a public reading at the center in Jamaica on December 11th, 2017 to celebrate the culmination of a writing workshop funded by Poets and Writers. Each member of the writing workshop read aloud from a piece written in the class. 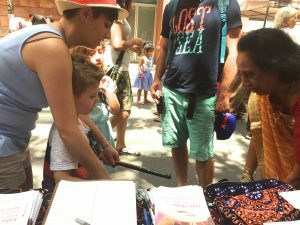 The classes were led by Sabbin Akhter, a teaching artist, originally from Bangladesh and a writer herself, who taught the class in Bengali. Our elders were very happy to share their work and thrilled to perform for an avid audience of their friends. Speaking on the occasion, Dr. Kalasapudi, India Home’s Executive Director, who is also a geriatric psychiatrist, talked about the positive psychological effects of recalling memories. At the end of the reading, every one of our readers were given a certificate acknowledging their achievements and there was a special cake for the occasion. 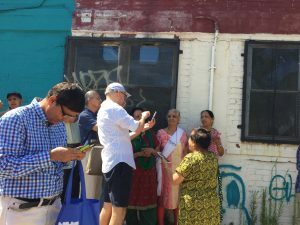 Sabbin Akhter, the teaching artist who led the writing workshops, wrote this reflection on her experiences with our elders in the workshop. To be honest, I first thought it would be a challenge to make them write. But to my surprise, I found they expressed themselves with spontaenity. Even though the program lasted only six weeks, I felt like the seniors had a passionate longing to do more. I tried to design each workshop ssession with a different task. In one workshop they talked and wrote about the natural phenomena and beauty of the villages they had left behind; in another I asked them to write about their loved ones. They told me they loved the exercise where they were asked to compose small stories or personal experiences based on Bangla proverbs and folklore. One time I said, “Write a letter to a long lost friend,” — a prompt I personally loved. Some of the seniors had doubts if they would succeed at this lost art. “ This is a hard-task,” one senior told me. But the next week I was amazed when they read aloud their imaginary letters to their long lost friends. The sparkle in their eyes and their glowing faces conveyed a lot more than their words. I felt their memories of warm sun playing on the pale grasses, brought them back to life. Our “faded corners were illuminated while walking through the golden lanes of memory, “ one said poetically to me. At the end of six weeks, we had a reading as the culminating event. The seniors themselves selected a favorite piece to read aloud. They had bonded over sharing their skills in workshop, and on stage they showered each other with love, care and appreciation. As I watched them read, my heart was content looking at their confident and happy faces. 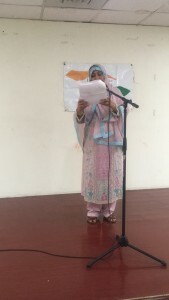 It’s India Independence Day, 2017, and at the celebration being held at Queens Borough Hall in Queens, NY, the young announcer invites the next act to come up on stage. 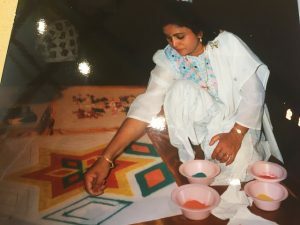 Ten women from India Home file in and start dancing, their bright white, orange and red saris billowing, their feet making dexterous patterns to the insistently upbeat music. 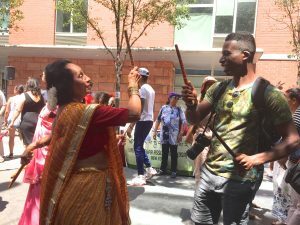 The scene is remarkable not for the fact that there are Indian dancers in Queens, but because the women swaying on stage are all between 65 and 85 years old. It is no coincidence that these women are so fit and vigorous. 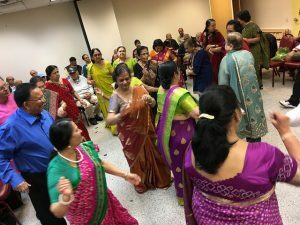 They have been dancing for years and are living proof of a growing body of research that links participatory arts activities to an increase in the health, well being, and quality of life in aging adults. One study of adults aged 60 and over suggested “health benefits of dance for older adults such as improved cognition and attention, posture and balance, and hand/motor skills in comparison to the control group. ” And it’s not just dance. 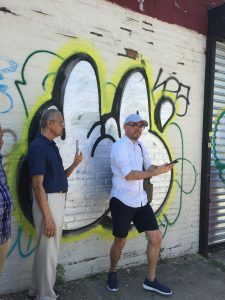 Createequity, a think tank and online publication “investigating the most important issues in the arts” has analyzed extensive research that shows that taking part in arts related activity benefits older adults in myriad ways. 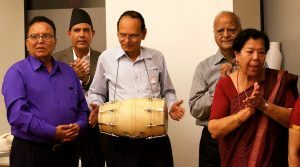 In 2006, the National Endowment for the Arts published the results of a landmark multisite (Washington DC metro area, Brooklyn and San Francisco) national study undertaken with the aim of “measuring the impact of professionally conducted community based cultural programs on the general health, mental health, and social activities of older persons, age 65 and older.” Referred to as the Creativity and Aging Study, it was the first effort in this area to use an experimental design and a control group to study 300 participants in the 65-103 age range. The results were striking. The 150 older adults who were involved in weekly participatory art programs reported: (A) better health, fewer doctor visits, and less medication usage; (B) more positive responses on the mental health measures; (C) more involvement in overall activities. The results pointed to the powerful positive effects of community-based programs run by professional artists, now known as Creative Aging Programs. What in the world is Creative Aging? Lifetime Arts, a nonprofit organization is very clear on what Creative Aging is not: “it’s not about making macaroni necklaces.” Creative Aging then according to Lifetime Arts is ” the practice of engaging older adults in participatory, professionally run arts programs with a focus on social engagement and skills mastery.” These are programs based in the belief that individuals do not stop growing or learning at any age. They are interventions, and disruptions that help older adults free themselves from traditional and limiting preconceptions about aging and decline and help them discover new possibilities, and new skills. Drawing with pastels in a class made possible by a grant from Lifetime Arts. At our Sunnyside Center, Creative Aging classes include photography and drawing workshops, recreational dance, as well as poetry and memoir classes. Our Sunnyside participants are so enthusiastic about the classes, they take photos of their work with their cell phones, so they can go home and practice before the next week rolls around. 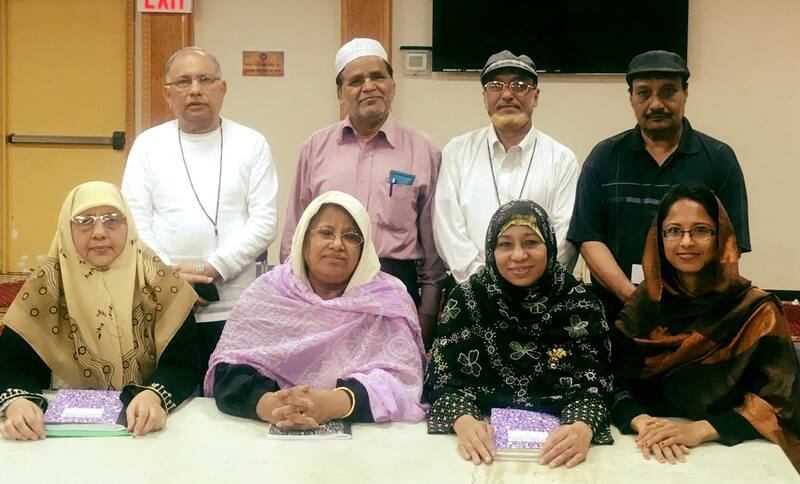 Meanwhile, our Desi Senior Center, India Home’s largest center in Jamaica, Queens, offers writing workshops to older Muslim men and women from Bangladesh thanks to a grant from Poets and Writers. In Beyond Nostalgia: Aging and Life Story Writing, author Ruth E Ray explains why writing and sharing life stories in groups is valuable from a developmental perspective for older adults. Writing and sharing life stories allows them to not only make public the methods by which they make meaning of their own lives, but also “seeing and hearing others” helps them to understand that they are not alone in that meaning-making process. 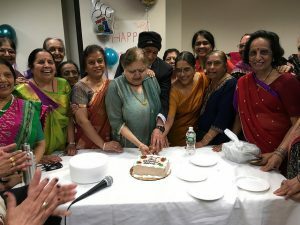 At our Desi Senior Center, the ten week memoir course meets for an hour and a half every week, and families and friends are invited to attend the final reading. 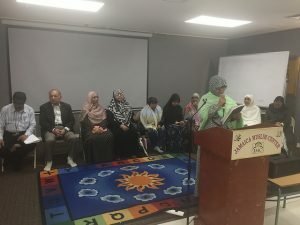 One recent Thursday, participants were encouraged by their instructor, Sabbin Akhter, a published writer herself, to read aloud from short memoir pieces that the elders had written to illustrate commonly used proverbs in Bangladesh. The readings were lively, full of dialogue and imagery. Lyrical descriptions of trees, cows, fields and the seasons evoked the villages from which the elders had migrated. As each writer in the circle finished reading their piece, the others applauded, shouting encouragement. “You get the first and second prize,” one grandmother told another, clapping her hands in delight. The sense of camaraderie and friendliness between the budding writers is palpable. 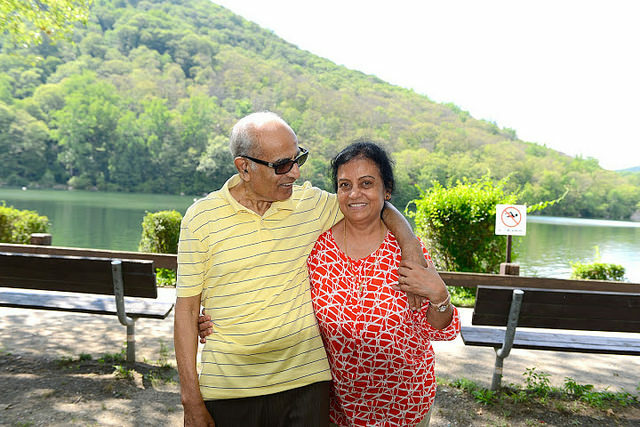 India Home is committed to intentionally engaging Creative Aging as a targeted program and our approach continues to evolve. Our aim, as it is with most of our programming, is to focus on creative activities that are culturally appropriate. 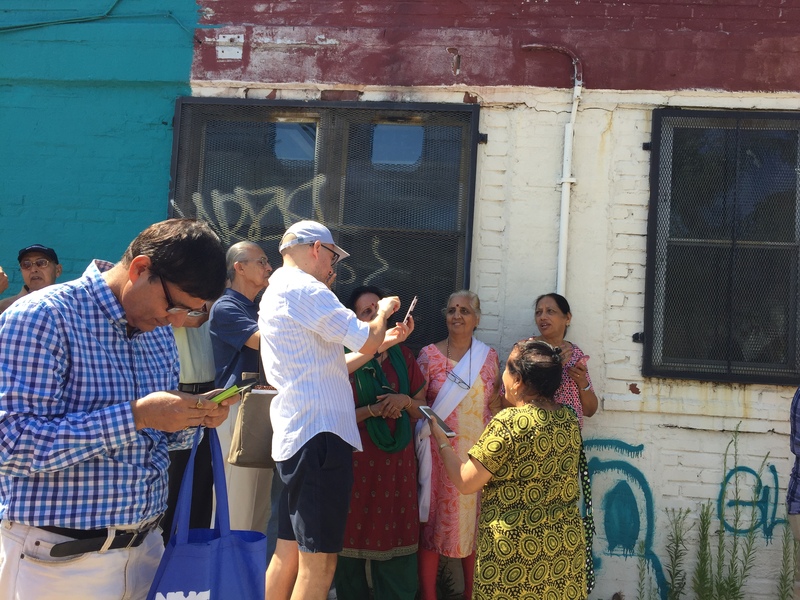 While it is sometimes challenging to find artists who speak South Asian languages or can offer culturally appropriate art activities, we persist because culturally relevant programming is the most effective way to reach the seniors in our communities. 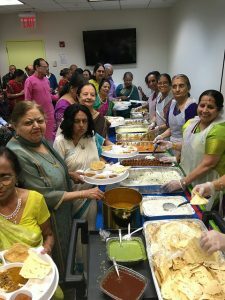 Still, watching our older adults laugh over a wonderful memory in their notebook, or admire a still life of colorful fruit that they created in an afternoon, or dance on a stage at the Rubin Museum, are reasons enough for us to constantly innovate and continue to offer these programs. Rosa Mendonza is singing. The 86 year old doesn’t speak much English, so she decides to sing instead. Her beautiful, rich voice rises in long trills above the crowd in the bright room and and seems to set the very trees outside the windows quivering. The murmuring crowd falls silent as her voice fills the room. She stops. Her audience draws a breath, then erupts into cheers. 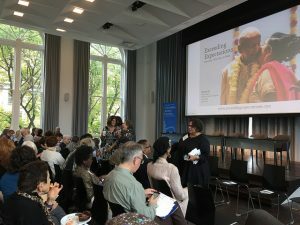 It’s a wondrous moment in a morning filled with revelation and wisdom that came from 18 or so elder New Yorkers who sit on chairs before a crowded audience in the auditorium of Columbia University’s Journalism school. 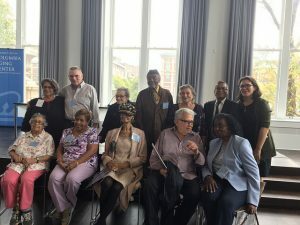 The audience had been invited by Columbia University’s Robert N. Butler Aging Center to celebrate the culmination of its Exceeding Expectations project. Started in 2015, by Ruth Finkelstein, a psychologist, and Dorian Block, a journalist, the storytelling project “explores how people find purpose later in life,” through writing, photography and video. The “people” in this case are aging New Yorkers who are disrupting expectations of what it means to grow old. “The goal was to show the lives of every day people and 20 people in every category of diversity were chosen,” according to Dorian Block. The elders being honored are certainly reflective of New York city’s diverse population. 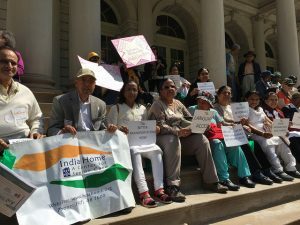 Among them is India Home’s own Chandrakant Sheth, an elder who has been a regular at our Sunnyside Center for years. A senior writer and photographer on the project, Heather Clayton Colangelo, shadowed Chandrakant as he went about his everyday life. She followed him to India Home, on his walks around the city, and into his room as he pecked away at his keyboard. She talked to him while he gardened, Skyped with his grandchildren, took art classes or hung out with his friends. 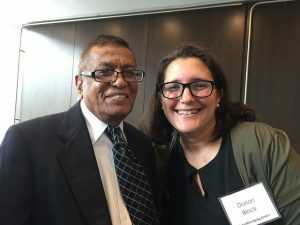 “Asking someone to be vulnerable and open their life up to a stranger is not an easy task, but from the beginning Chandrakant was willing to go outside of his comfort zone and share his life and thoughts with me,” Heather said in an interview for this blog in 2016. Like Heather, other project staff chronicled the every day routines of each of the 19 men and women they followed. The result is a rich, fascinating glimpse of aging New Yorkers in their later decades–captured through film, photographs and writing. The stories were told in their own voices, in their own language, set in their familiar surroundings. These chronicles of the everyday are moving and funny, and occasionally tragic. The goal was to change hearts and minds, to make people see aging in a whole new way and more nuanced manner, as another life stage. The project asks viewers to understand that each of these individuals and their stories are unique. For instance, there’s Sylvia Lack, an 84 year old New Yorker and lifelong activist, who has traveled to Albany for 40 years to advocate for social justice issues. “Every time I get on that train to Albany, the attendant greets me with “Here comes the No.1 Democrat!” she recalled to the delight of the crowd. Chandrakant, like so many of the others who’s stories we heard, had never stayed in his own circle. 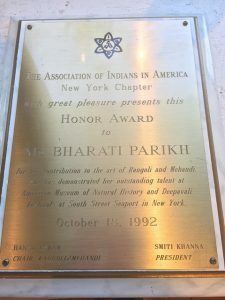 He had ventured far, far from home, having come to New York from India in 1969. For 40 years, he had worked and lived in this city, had moments of struggle and happiness, and created a new life and story for himself. 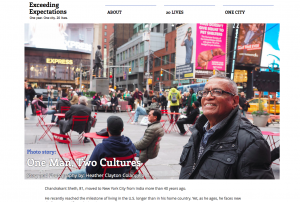 Now his unique immigrant story will become part of an invaluable record created by one of the world’s great universities and help others understand what it means to grow old in New York. Lord Ganesh, the roly-poly, elephant-headed Hindu God is beloved of devotees not only across India, but also Nepal, Tibet and other Himalayan communities. 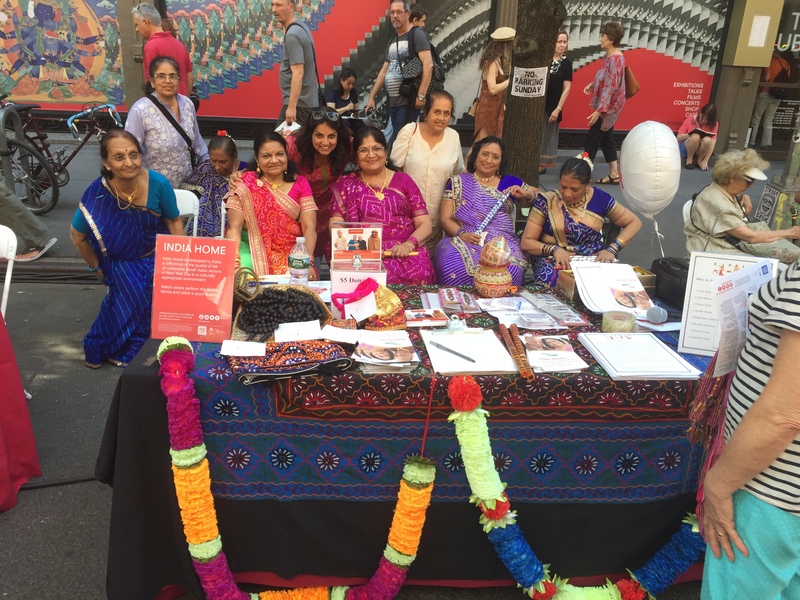 As part of India Home’s on-going partnership with the Rubin Museum of Himalayan culture in Manhattan, our members, immigrants from India and Nepal presented a program for the Himalayan Heritage unit on their relationship with Ganesh. 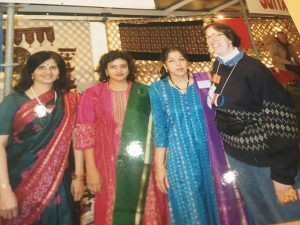 The audience was diverse and was made up of people who ran the gamut from those who loved Himalayan culture and had visited India or Nepal several times, to curious folks who had wandered in out of a cold, rainy evening. What they got were stories: childhood memories of waiting for hours in line to catch a glimpse of the most famous Ganesh statue in all of Bombay; a Nepali myth of Ganesh incarnated as a warrior God who breaks his tusk to throws it at the jeering moon; and surprising accounts of Tantric offerings of meat and whisky from Renu Shreshta, a member of the Newari community of Nepal. 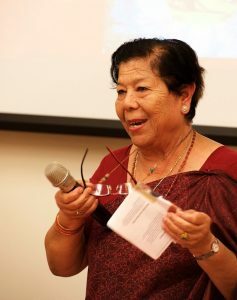 Renu Shreshta, an immigrant elder from the Newari community in Nepal, related myths about Ganesh and her community’s unique rituals that include offerings of meat and whisky. 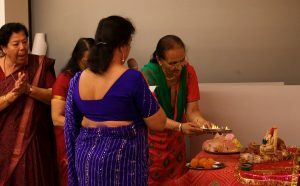 Our elders also enacted the rituals of worship, wether it was the installation of a tiny statue of Ganesh, or the “visarjan” or immersion that is part of the cycle of the celebrations for Ganesh Chaturthi (Ganesh’s Birthday). 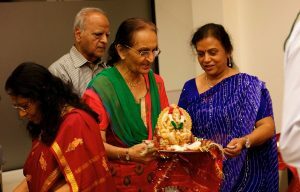 Meera Venugopal, India Home’s staff explained how the clay body of the God animated by the ardor of worship is returned to nature by being immersed in moving water. Just as our bodies are returned to the elements through death, so too Ganesh is sent off on his journey, only to be welcomed again next year. 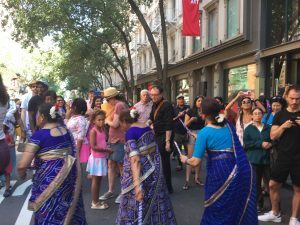 The program ended in true South Asian fashion with feasting–there were samosas, hot tea, and laddoos, beloved sweetmeat of Ganesh. 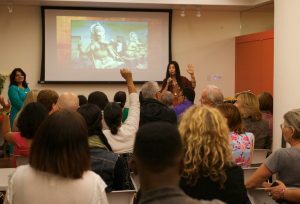 Once again Rubin Museum’s audiences had an opportunity to experience a culture through the authentic medium of stories of lived experience. Our elders were thrilled to share their lives, perform and be seen as active, talented story-tellers and performers. The Museum of Modern Art in New York City is the largest and most influential museum of modern art in the world. 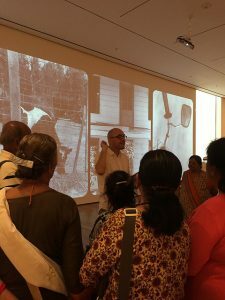 As part of a creative aging initiative, our seniors got to engage with the art of photography in the MoMA. 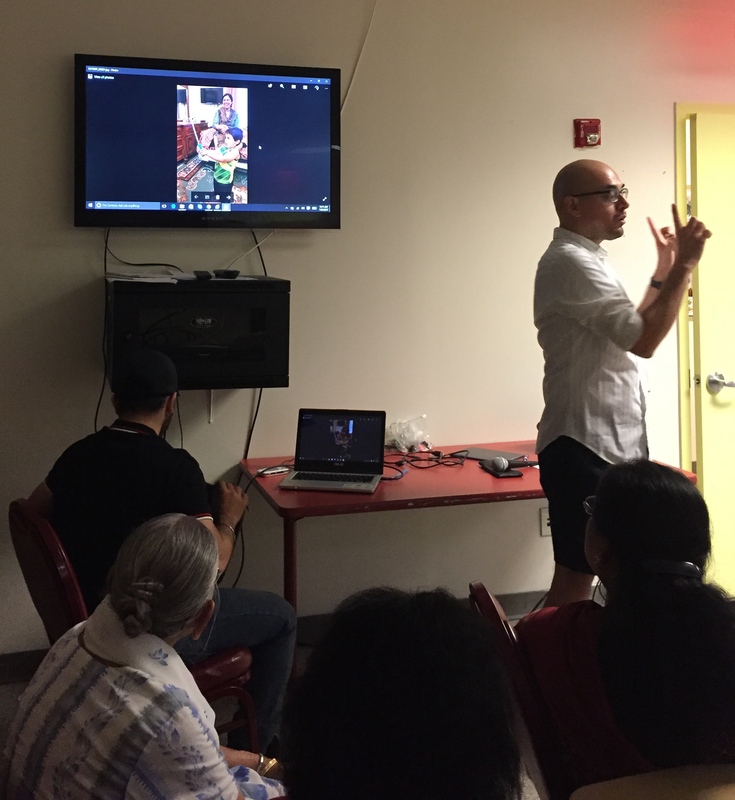 The program featured a guided tour of exhibits, and two photography classes at our center conducted by Jano Cortijo, an artist-educator from the museum. Henri Carter-Bresson, considered one of the world’s greatest photographers, said, “In photography, the smallest thing can be a great subject.” Our seniors were encouraged to look for the smallest thing in a photo and asked to wonder why it had been included and what effect it had on the photograph. We looked at light falling through a sheet, the lines on a tower, various graphic shapes in Robert Rauschenberg’s work — with Cortijo asking guiding questions that made our seniors understand the many choices that go into making a photograph. 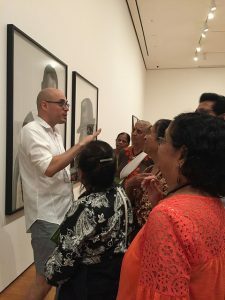 We talked about Samuel Fasso’s self-portraits which have him taking on roles of his heroes like Nelson Mandela and Angela Davis, and his attempt to take on a larger political and activist role as an artist. After looking at photos by famous artists, our seniors got a lesson in taking better photographs using a smartphone. They learned about backgrounds, about lighting, angles, position of the photographer, focus on the subject and rudimentary editing. 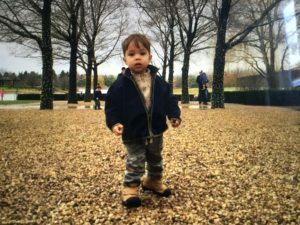 They also learned about the difference in portrait photography versus landscapes, tricks to modulate the brightness in iPhones and so on. Cortijo, the artist-educator, also assigned our seniors “homework.” They were asked to take photos at home using their new found skills. When their homework assignments were displayed on the TV, the class enthusiastically critiqued the results – generously pointing out what worked in the photos as well as the flaws. Our seniors listened avidly and responded with enthusiasm to this foray into photography as art. While it is true that modern technology has made taking a photograph easy, it was fascinating for seniors to see it as an art form, one that required more than just a point and click. We could see that the lessons had made a difference–many of the photos taken after the class showed that they were paying attention and practicing their skills! Our seniors loved the tight focus on the little boy, the symmetry of the trees, the repetition of ochre color in this photograph. (c) Jayesh Patel. They danced on the stage, they danced in the street, they danced in front of our table. They were India Home’s wonderful senior ladies and nothing was going to stop them. Not the heat or the crowds or their sore feet. Our wonderful seniors had come prepared to be the life and soul of the Annual Rubin Block Party and they gave it their all. Our seniors taught everyone, from the littlest guests to seniors like them, how to use the dandiya sticks. They demonstrated garba dance steps. 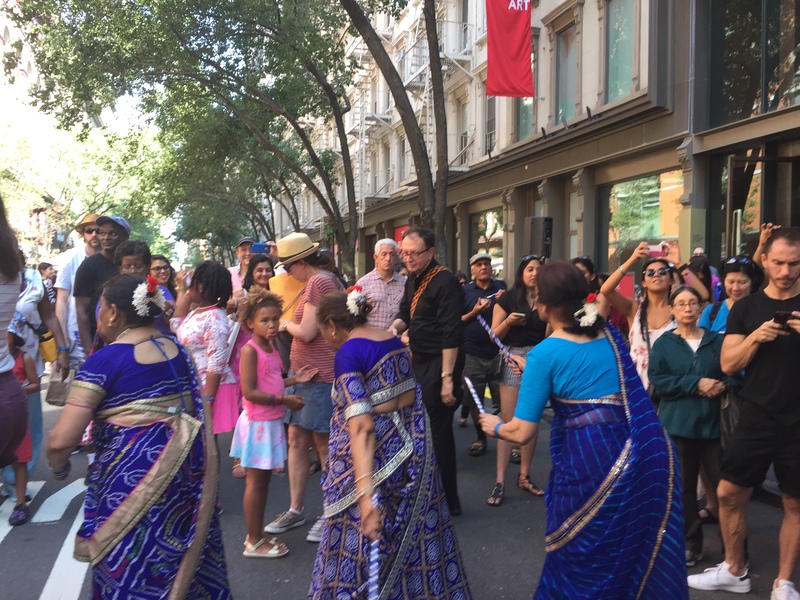 They let people admire their beautiful chaniya choli (skirts and blouses) or saris. They also got the entire crowd to join in the dancing at one point. 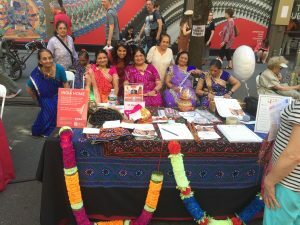 We were thrilled to be one of the 6 community groups invited by the Rubin Museum’s Dawn Eshleman, Jane Hsu and Tashi Chodron to be part of the renowned Rubin Museum’s Annual Block Party that is held every summer. What we didn’t realize through all the planning and meetings was that it would offer so much fun for all concerned. On a more serious note, our immigrant seniors who are also people of color, are sending a a very important message by participating in giant public events like the Rubin Block Party. Their very presence in these spaces demonstrates that older people of color are active and engaged in public life, that aging is what you make it to be. 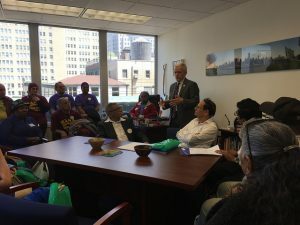 Their visibility helps to break down prejudices and benign ignorance around aging and seniors of color, and forces people to change their perspectives. 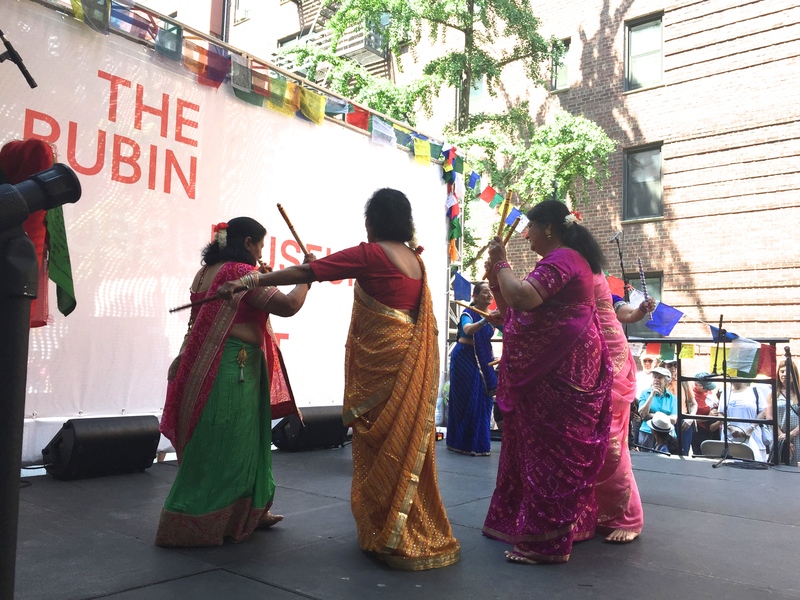 Our mission is to challenge the stereotypes around aging, and we are grateful to the Rubin Museum for helping us realize it. 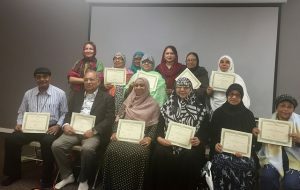 Ashwak Fardoush is a writer, writing coach and teaching artist, who recently facilitated the Writing Workshop for older adults at India Home’s Desi Senior Center. The room buzzed with anticipation. The smell of cooked chickpeas and onion lentil fritters served to the guests still lingered in the air. Children’s cries rang out in the background. Amidst the noise, Salema Khatun took the stage. 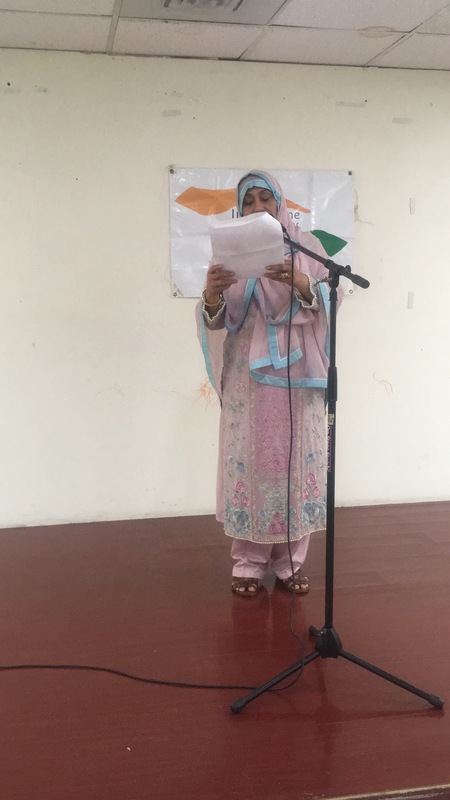 She recited her poem, “Shadhinota” (translated as “Independence”), alluding to the Liberation War of 1971 in Bangladesh. I felt proud as I watched her read her poem to the audience. 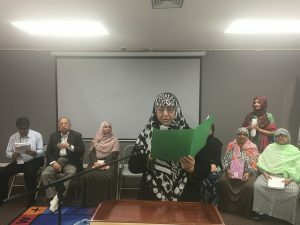 Salema Khatun was one of the eight participants who were part of a bilingual memoir writing workshop* at the Desi Senior Center. This workshop was designed to help seniors tell their stories. This pilot program was a collaborative effort, making the phrase “it takes a village” truer than ever. 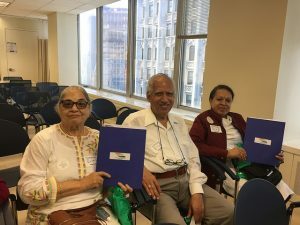 The staff from India Home and the Desi Senior Center—especially Lakshman Kalasapudi, Nargis Ahmed and Meera Venugopal—worked tirelessly to make sure the seniors had a great writing experience. As I heard Salema Khatun’s voice rise and fall, I remembered the first day of the writing workshop. It was a Thursday morning. I was setting up the classroom in one corner of the prayer room. Some were still praying on the other side of the room. I arranged the chairs in a circle and laid out the attendance sheet and the writing supplies on a chair. I had thought about the content and the structure of the workshop for the past two weeks. I even had a bare-boned lesson plan for the first session. Yet, I knew that I couldn’t plan out all the sessions. I was not teaching these participants. Instead, I was holding the space for the participants to tell their stories—stories that danced inside their bodies, that rested inside their eyes, that settled on their skin. I simply needed to let these stories surface on the page. While facilitating the workshop was not like any other teaching experience I had in the past—the participants were a few decades older than me, and the sessions were conducted entirely in Bengali—the advice I gave myself remained the same: I must keep my heart open, stay present and be curious. There were eight participants who made up the core group: Md. Hoque, Md. Mokbul Hossain, Rafiqul Islam, Salema Khatun, Haque Mohammad, Quamrun Nahar, Md. 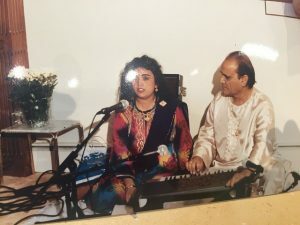 Abu Sayeed, and Farida Talukdar. I did not know what to expect each session. By the second session, I stopped bringing a thorough plan. The participants were vivacious, creative, mischievous, intelligent, wise, and in awe of life. We would always begin with a writing prompt from my plan, but then the session would unfold in ways I could never predict. We would write spontaneously. Soon, I became adept at reading what the group wanted in that moment in order to serve them and their writing. Each session the participants excavated memories from their long, rich, vibrant lives and shaped them into poems and personal essays. When I closed my eyes, I could see the writers leaning over their marble notebooks, and scribbling away. Sometimes we would travel to far-flung places or go deep within ourselves. Sometimes personal stories would unfold against the backdrop of history. 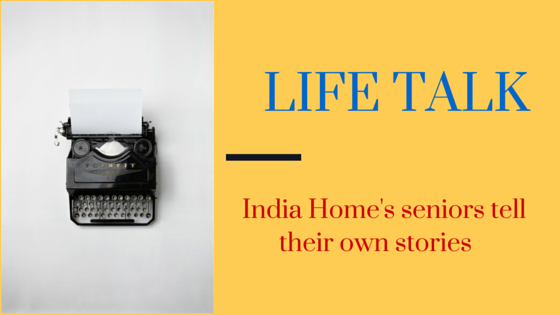 At times, the participants tried to write out a decade of their life during a session. Sometimes, I would ask the participants to scrawl a word on an index card, fold it and put it inside a mason jar. Then, I would ask a participant to pick a word out of the jar randomly and the group would write about that word. The first word picked out of the jar was “baba” (translated as “father”). Writers wrote about their love stories, their childhood friendships, and their son’s letters back home. Every session was memorable in some way. Once, I remembered seeing Md. Hoque writing in his notebook a few steps away from the class. Since the session was about to start, I gently asked him to come inside. He nodded, but his head was still buried in the notebook. A few minutes later, he entered the classroom and announced that he had just finished writing a poem. He not only addressed this poem to another participant, Md. 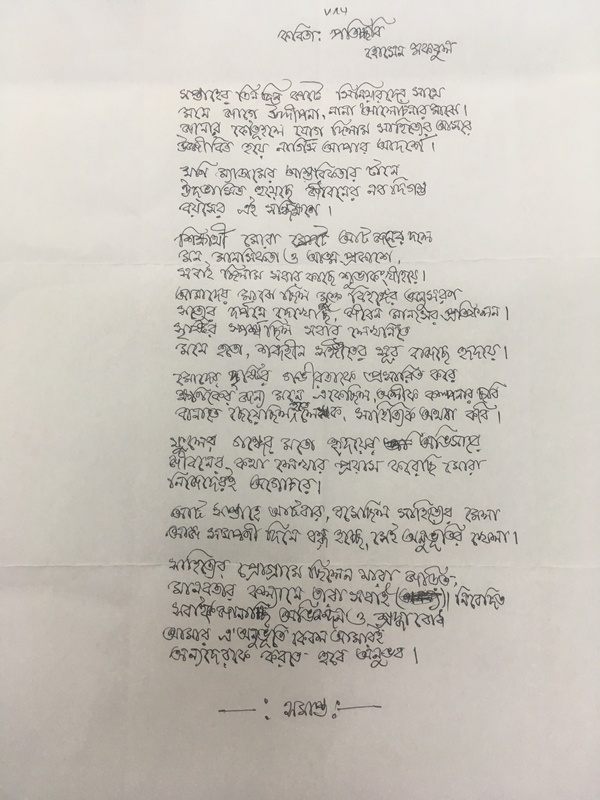 Mokbul Hossain, but he also challenged his peer to respond back in the form of a poem. Md. Mukbul Hossain was deemed as the poet of the group. Even before the workshop, he had a moleskin notebook with poems written in his beautiful penmanship. He once showed me a poem he wrote in his notebook. The first line was a question a stranger posed him on his walk. He told me that he carried his notebook with him so that he could write down any detail, mundane or not, that can turn into a poem someday. Needless to say, Md. 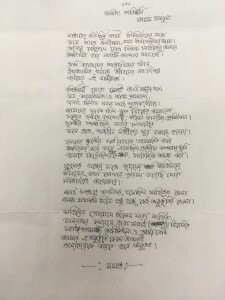 Mukbul Hossain managed to cobble together words to pen a poem to respond to Md. Hoque’s friendly challenge in class that day. Abu Sayeed was another participant in the workshop. 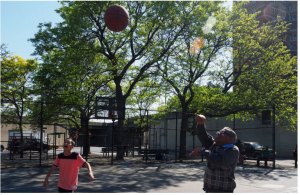 He took two trains and a bus to travel from Brooklyn to the senior center in Queens. Before the first day of class, he told me of his interest in the writing workshop. 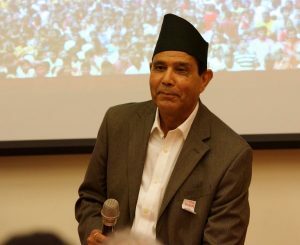 He shared that his life was full of “korun” (tragic) stories and wondered if it was okay for him to write about those stories in the workshop. “Yes,” I said. “Life is full of joy and sorrow. Sounds like you have lived and have stories to tell! Please come and write with us.” So, he did. Md. Abu Sayeed would read his stories out loud in a voice that would tremble and crack at times. We would all listen, understanding the gravity of the moment and our role in it. I was surprised by how eager everyone was to share their writing with each other. The ink would still be fresh on the page, our head would still reel from the memories we had dredged up on the page. Yet, the participants were ready to share their writing immediately. Quamrun Nahar read about scaling a tree as a child and falling down from it one day when she was stung by bees. She was carried to the kitchen where her grandmother rubbed garam masala paste all over her body. 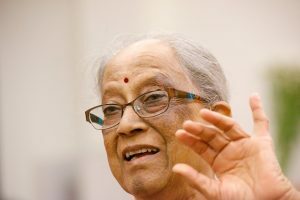 In a similar vein, Farida Talukdar often shared her anecdotes. We rarely made past the first writing prompt. The pieces people shared after the first prompt would inspire others to share their personal stories or debate passionately about a topic that surfaced in someone’s writing. 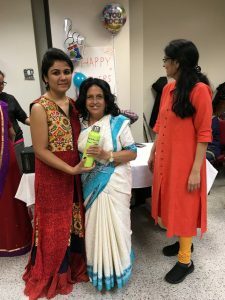 We found ourselves discussing how in-laws’ relationship should be toward their children’s spouses, the struggles with upholding the Bengali language and culture in the United States, and the political climate in Bangladesh. At the event, I looked to the stage once more. Salema Khatun had finished reading her poem. She paused for a moment and looked out at the audience. The crowd broke out into applause. Salema Khatun walked off stage. I smiled and then closed my eyes: I imagined the participants pulling out their marble notebooks and writing away with their ball point pens, putting one word after the next word after the next to tell all the stories they held inside of them until they were spent, until they were empty, until they were fully satisfied. *This Writing Workshop was funded in part by Poets & Writers with public funds from the New York State Council on the Arts with the support of Governor Andrew Cuomo and the New York State Legislature. You can read the full publication of the writings by clicking here.